Mrs. Louis (Caroline) Kirchhoff, aged 79 years, passed away at her home in Sollitt after two weeks illness, Tuesday morning, at 2:30 o’clock. 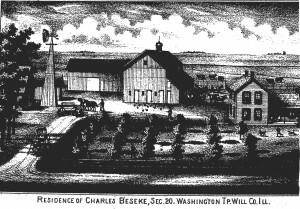 She leaves two children, Mrs. Marie Strong and Charles Kirchhoff, four grandchildren, one great grandchild, and two brothers, George Beseke of Beecher and Henry Beseke of Minnesota. Funeral services will be conducted by Rev. G. Horst, Friday, at 1:30 p.m. at the residence in Sollitt and at 2:00 o’clock at St. Luke’s Church. Interment will be in the Beecher Mausoleum. 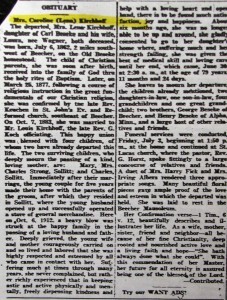 The departed, Mrs. Lena Kirchhoff, daughter of Carl Beseke and his wife Laura, nee Wagner, both deceased, was born, July 6, 1862, 2 miles southwest of Beecher, on the old Beseke homestead. The child of Christian parents, she was soon after birth, received into the family of God thru the holy rites of Baptism. Later, on March 25, 1877, following a course of religious instruction in the great fundamentals of our Christian religion, she was confirmed by the late Rev. Kewschen in St. John’s Ev. and Reformed Church, southeast of Beecher. 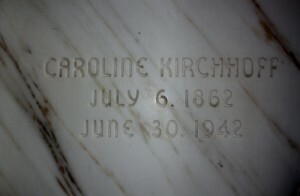 On October 7, 1883, she was married to Mr. Louis Kirchhoff, the late Rev. G Koch officiating. This happy union was blessed with four children, of whom two have already departed this life. The two surviving children, who deeply mourn the passing of a kind, loving mother are: Mary, Mrs. Charles Strong, Sollitt; and Charles, Sollitt. 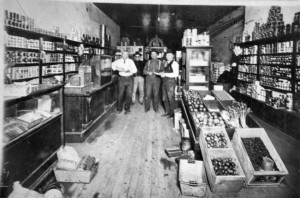 Immediately after their marriage, the young couple for five years made their home with the parents of the groom, after which they resided in Sollitt, where the young husband opened up and successfully operated a store of general merchandise. Here on October 6, 1912, a heavy blow was struck at the happy family in the passing of a loving husband and father. Deeply grieved, the young wife and mother courageously carried on and so lived and labored that she was highly respected and esteemed by all who came in contact with her. Suffering much at times through many years, she never complained, but rather richly experienced that in keeping astir and active physically and mentally, freely dispensing kindness and help with a loving heart and open hand, there is to be found much satisfaction, joy and happiness. About six months ago, she was no longer able to be up and around, she gladly consented to go to her daughter’s home where, suffering much and her strength failing, she was given the best of medical skill and loving care until her end, which came, June 30, at 2:30 a.m., at the age of 79 years, 11 months and 24 days. 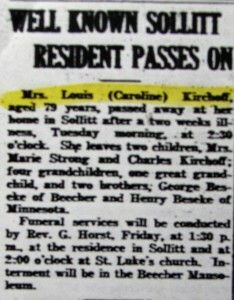 She leaves to mourn her departure, the children already mentioned, two daughters-in-law, one son-in-law, four grandchildren and one great grandchild; two brothers, George Beseke of Beecher, and Henry Beseke of Alpha, Minnesota and a large host of other relatives and friends. Funeral services were conducted, Friday, July 3, beginning at 1:50 p.m. at the home and continued at St. Luke’s Church, where the pastor, Rev. G. Horst, spoke fittingly to a large concourse of relatives and friends. A duet of Mrs. Harry Fick and Mrs. Irving Albers rendered three appropriate songs. Many beautiful floral pieces gave ample proof of the love and esteem in which the departed was held. 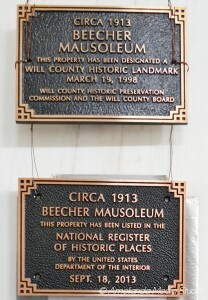 She was laid to rest in the Beecher Mausoleum. Her Confirmation verse – 1 Tim., 6 v. 12, beautifully describes and illustrates her life. As a wife, mother, sister, friend and neighbor – all because of her fine Christianity, deep rooted and nourished active love and a living faith and hope — “She hath always done what she could.” With this commendation of her Master, her future for all eternity is assured being one of the blessed of the Lord.